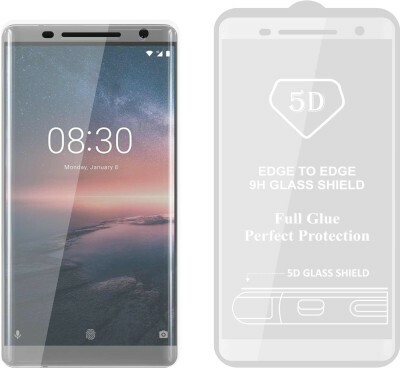 \"CASE CREATION Full Glue Body GLASS SPECIFICATIONS :- 1) FULL 5D BODY Edge to Edge Adhesive COVERAGE -Case Creation Tempered Glass Supports full Edge to Edge Adhesive Screen Protection Providing Superior Coverage to Smart Phone Mobile Screen. 2) 5D CURVED ROUND EDGES - Case Creation Tempered Glass has Premium 5D Curved Round Edges to give smooth experience around the Edge of your Smart Phone . 3) 5D TOUCH COMPATIBLE -Case Creation Tempered Glass exhibits high touch sensitivity & smoothness and excellent interoperability with 5D Touch Sensors. 4)ANTI SCRATCH -Case Creation Tempered Glass with Nano Primer coating provides excellent adhesive strengthening, surface hardness and chemical resistance to scratches and corrosion.Shock ResistantCase Creation Glass exhibit high shock resistance and 9H hardness. 5) The Nano coated primer provides increased shock resistance function. 6) HD CLARITY -Case Creation Tempered Glass exhibit 100% transparency and retains the clarity & experience of original glass. 7) WATER & OIL REPELLENT-Hydrophobic Nano coating provides superb Water & Oil repellent properties. Easy to clean performance and Anti smudge. 8)ANTI-FINGERPRINT -Case Creation Tempered Glass is coated with Nano primer to provide Anti Fingerprint and Fouling. The screen looks new and refreshing always\"